Alright moms and dads, gather your little ‘monsters’ and get ready for some family fun at the theaters this fall! 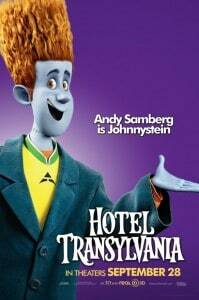 Columbia Pictures presents a Sony Pictures Animation film, Hotel Transylvania. 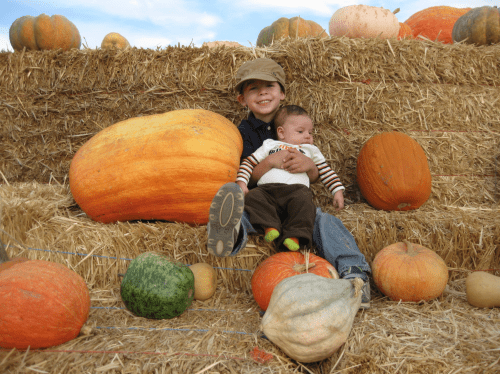 Hotel Transylvania comes at a perfect time to transition into one of my favorite seasons— Fall! As the cool weather sets in this is one movie you won’t want to miss. With Halloween right around the corner, this would be the perfect movie to introduce your children to these spooky characters. I know for us, my son has always been a little scared of Dracula and Frankenstein, but with Hotel Transylvania he has warmed up to them and realized that deep down inside, they are “human” just like us! In Hotel Transylvania, it turns out that the world’s most famous monsters – including Dracula, Frankenstein, the Werewolf, the Invisible Man, and the Mummy – are just like regular people, with families and problems and a need to get away from it all… but unlike humans, they have to live in hiding from a world that thinks they’re, well, monsters. What better place to hide than Hotel Transylvania, which Dracula himself operates as a sanctuary from the rest of the world and has been human-free since 1898? But Dracula has issues of his own… his daughter, Mavis, is a teenager – in fact, she’s about to turn 118 – and as she becomes a woman, the vampire’s greatest fear is losing his relationship with her. Well, his two greatest fears are losing his relationship with his daughter and garlic, but that’s another story. Hotel Transylvania has an amazing cast of voices from Adam Sandler, Selena Gomez, Fran Drescher, Kevin James, Andy Samberg, CeeLo Green and more! 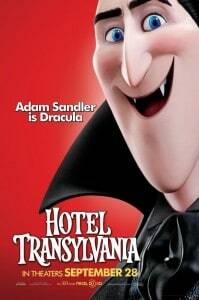 Adam Sandler plays Dracula. He has all of the qualities that make the Prince of Darkness the indisputable leader of monsters – his strength, dominance, charisma, and perhaps over-controlling nature – also happen to make him an excellent hotel manager. Problem is, where his daughter Mavis is concerned, he’s a softy. Fearful for his daughter’s safety, he’s kept her in the sanctuary of his hotel her entire life, away from the torch-wielding humans he remembers so well. But now, on the eve of her 118th birthday, he must keep a promise he made to let her see the world for the first time. Unfortunately, in the midst of this, a hotel brimming with monster guests, and the unexpected arrival of the first human ever to set foot in the castle, Drac’s well-laid plans start to unravel fast. What is a doting vampire father to do—continue to protect Mavis from the threat of humans, or relinquish control and let her spread her (bat) wings and fly…? 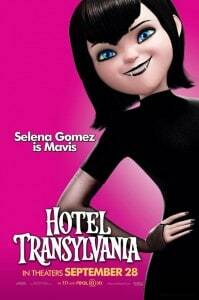 Mavis is played by the voice of Selena Gomez. She is totally pampered by her father; however, she is headstrong and smart, and in many ways, a typical 118-year-old teenage girl. She’s grown slightly bored with the domain of her childhood—she has lived within her father’s hotel and its grounds all her life—and she longs to travel, experience life and see the world. Now, she’s met a newcomer who could make that a real possibility: but should she leave and risk breaking her father’s heart, or remain, and break her own? Jonathan is played by the voice of Andy Samberg. He is a typical 21-year-old human, backpacking his way across Europe in his continuing worldwide travels. He’s confident, full of life, talkative, curious and good-natured—not to mention amazing on a skateboard. His motto is “just roll with it.” Now, in his wandering, he’s stumbled onto a hotel full of…monsters!? To help him blend in (and keep the monsters unaware of the security breach), Drac disguises him as Johnnystein, Frankenstein’s supposed cousin. Drac’s plan backfires, however, when his daughter Mavis and ‘Johnnystein’ hit it off, and Jonathan ignores his earlier promise to Drac, to run at his first opportunity. Because hey, this monster thing is kind of cool – and he’s intrigued by a cute teenage vampire girl. 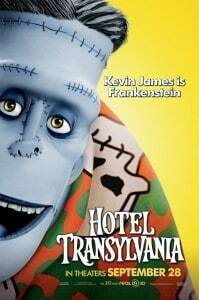 Kevin James plays Frankenstein. Dracula’s best friend (and Mavis’ favorite “Uncle Frank”) is none other than Frankenstein—an oversized working man with an even bigger heart. It’s been a long time since this monster stormed through the countryside, frightening villagers and constables alike. Now, he’s an unassuming married man who loves his adoptive family, Drac and Mavis. Imagine his surprise when he and his wife Eunice show up for Mavis’ 118th birthday party—and he is introduced to a cousin he’s never met, Johnnystein (human Jonathan in a last-minute disguise). Well, family is family, even if he looks a little strange, and Frank is happy to get to know his somewhat short and newly discovered relative.